Alexander Gronsky was born in Tallinn, Estonia, and lives and works in Riga, Latvia. Between 1999 and 2008 he worked as a press photographer for the Russian and international media, covering Russia and the former USSR. He is one of a number of artists who are exploring identity and place within the ‘new’ Russia, and his photographs explore the ‘in-between-ness’ of a landscape – forgotten corners and edges of parks and lakes. Since 2008 he has been developing his own projects, including Pastoral, 2008-2012. 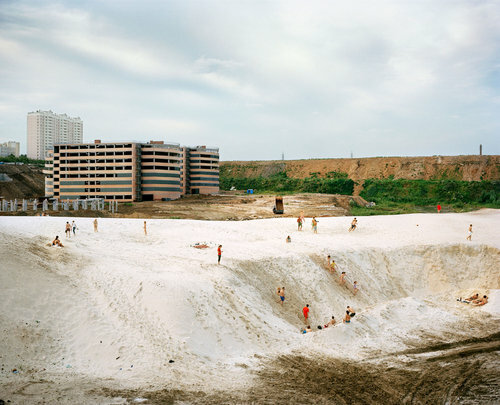 This series looks at the liminal areas between town and country, in this case, the outskirts of Moscow, and how people use them, to play, swim or relax. We see groups of people swimming in polluted lakes and having picnics on threadbare grass. Some of the images show people sunbathing in woods, with tower blocks glimpsed in the background, through the trees. In another series entitled Reconstruction. Gronsky has used Russian History paintings as the reference to remake war scenes. His soldiers are amateur war re-enactors, acting out scenes before crowds of onlookers, lying in deep snow and checking their mobile phones. Pastoral is an idea of a perfect world, where people integrate with nature as its necessary part. With this documentary project I explore wastelands within Moscow city. It is here that I am able to see interaction between human and nature in a very dense way. Areas of abandoned land form a big part of Moscow cityscape. Arguably its exactly these areas that define it as being “Russian”, but at the same time these areas itself lack definition. They are neither urban, nor rural. Invasion of chaos in human habitat and also the place where people come to enjoy nature in quite sad and touching ways. My focus in this project is people’s detachment and at the same time longing for reuniting with nature. The title of the cycle is ironic. A pastoral always depicts a rural idyll, in contrast to the life of city dwellers, to whom it is addressed. In Gronsky’s cycle, the cardinal difference between the rural, the natural and the urban is lifted. This particular pastoral is not about a contrast, but about an indefinite transition. Gronsky is a landscape photographer at heart. His skilful use of perspective and talent for composition lead the observer’s eye deeply into the landscape, generating a sense of astonishment for every place portrayed in photo. But simple astonishment deepens into something more complex as we take in the layered images. These images (in the Pastoral series) capture a sense of what it is like to live in Moscow, but is something we can all relate to, as we live in cities and try to find some way to connect to nature and the countryside.